“Education: None. Skills: None. Merits: None.” So reads Gully Foyle’s Merchant Marine card. But, Gully has managed to survive for 170 days in the airless purgatory of deep space and to Escape to Terra with a murderous grudge and a secret that could change the course of history. In this pulse-quickening novel, Bester imagines a future in which people “jaunte” a thousand miles with a single thought, where the rich barricade themselves in labyrinths and protect themselves with radioactive hit men – and where an inarticulate outcast is the most dangerous man alive. Alfred Bester is certainly not a household name in the world of books and authors, not even in many Science Fiction circles. As someone who was writing at the same time as Isaac Asimov, Arthur C. Clarke, and Robert Heinlein, Bester tends to get a bit overlooked. He was also not nearly as prolific as those more famous SF authors, but his novels are still worth reading. 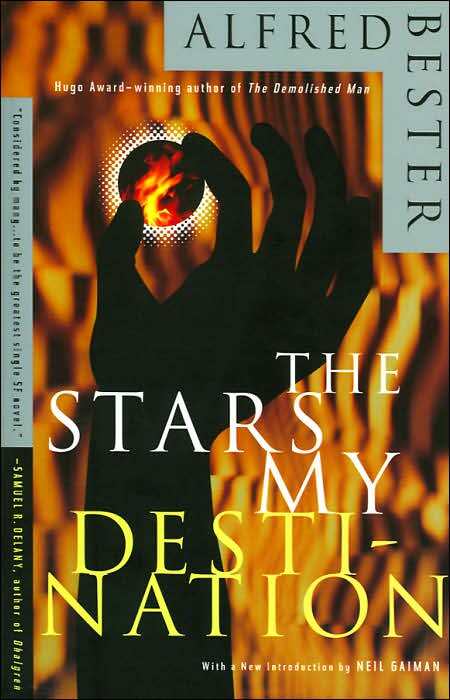 In fact, Bester won the first ever Hugo Award for best novel for his book The Demolished Man. “Stars” was originally serialized in four parts in Galaxy magazine, and later published as a full length novel in 1957. Legend has it that the story idea came to Bester after seeing a newspaper article about a Chinese sailor who survived alone shipwrecked in a raft for 133 days – longer than anyone else on record. Several ships spotted the sailor but were afraid to pick him up, suspecting that he might be bait to lure them within torpedo range of a hidden submarine. I read this book years ago and it instantly became one of my all time favorites. I don’t know why, but I just identified with Gully and found myself rooting for him as he sought his revenge. Another indicator that this book might be for you, is that the introduction to the most recent edition was written by Neil Gaiman (more on him soon). Fun fact: for those who have enjoyed The Eyre Affair (see previous post), Gully Foyle has a small cameo appearance in the 3rd book in the Thursday Next series, The Well of Lost Plots. If you like this book, you may also enjoy The Forever War by Joe Haldeman, Gateway by Frederick Pohl or Lord of Light by Roger Zelazny. This entry was posted on November 4, 2009 at 5:00 am and is filed under Book Suggestions by WCPL Staff. You can follow any responses to this entry through the RSS 2.0 feed. You can leave a response, or trackback from your own site. The name foyle also pops up on page 331 of the Eyre affair.